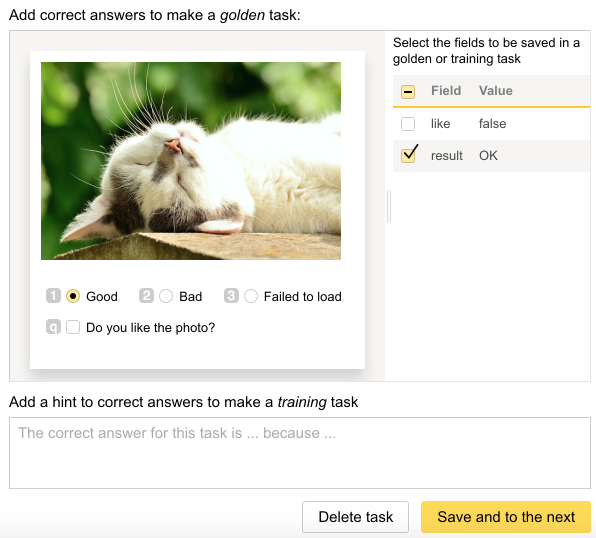 Task markup lets you add correct answers and hints to the tasks, as well as edit them. You can turn a main task into a control task by adding the correct answer, or into a training task by adding the correct answer and a hint. Task markup is available only for training pools and pools uploaded with the “smart mixing” option. Make sure the pool is not running. Click the Edit button in the Pool tasks section. Add or edit the correct answer and hint. In this example, the correct answer is added for the control task. Only the choice in the result (Good/Bad/Loading Error) is checked.